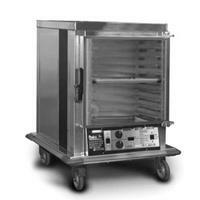 Proofing cabinets provide humidity and heat needed for yeast products (breads, rolls, etc.) to rise. Ability to hold humidity levels up to four hours without refilling reservoir. Adjustable humidity control. Patented TEMP-GARD® air flow design (patent #6,847,013 B2). Standard units feature 120-volt 20-amp electricity*. Aluminum construction on exterior and interior. Bottom mounted control panel and heating system removes easily for cleaning or servicing. 2000-Watt heating capacity—via two elements: one 1000-watt element for heated air, and one 1000-watt element for humidity control—with internal air temperature up to 200°F. 1500-Watt is optional on 120V only. High-temperature protection device with caution alarm and auto reset. Full 270° open door swing via 3?16? (5mm)-thick heavy duty aluminum hinges with stainless steel pin. Positive closing magnetic door latch. Units with narrow width and optional wide width* feature 2-1/4" (57mm) increment slide spacing. Units with optional extended width feature 3" (76mm) increment slide spacing. Available in both non-insulated and insulated. Insulated units feature identifying color stripe on both sides. 8(2438mm) cord and plug provided. Full perimeter bumper on all models. Heavy duty 5" (127mm) polymer swivel casters, two with brake. Easy-touch front control panel with membrane switches. Liquid Crystal Display (LCD) read-out. Digital setting of air temperature.